Circa 1800. 2009 Winner - Travelers' Choice for Romance. 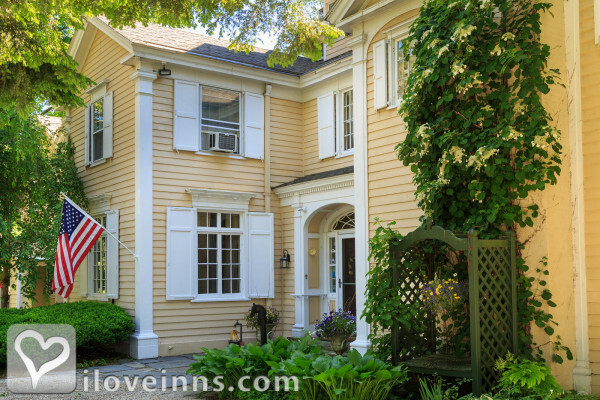 Devonfield is a gracious English-Style country house built in the late 1800s. 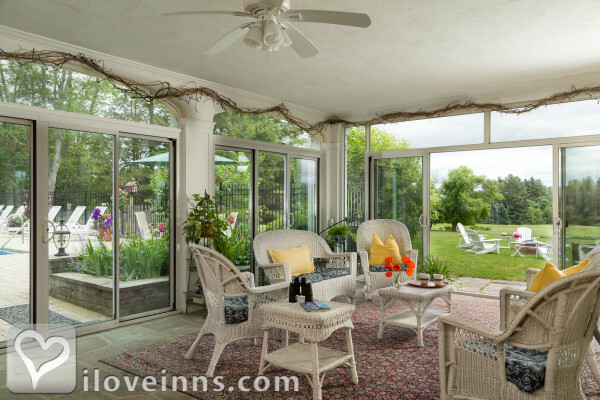 Overlooking a pastoral meadow shaded by graceful birch trees with the rolling tapestry of the Berkshire Hills beyond, the B&B sits on 29 acres. 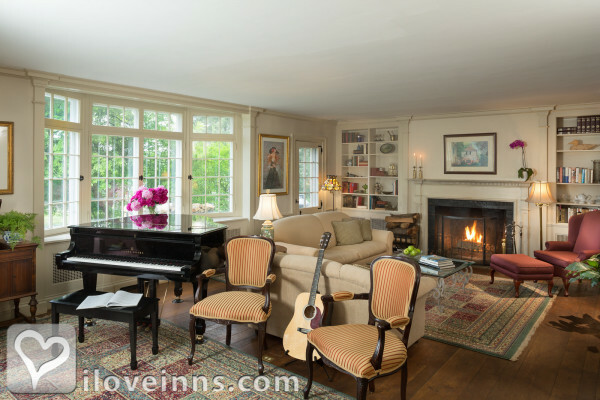 In the main house, a fireside living room is complete with grand piano, library and stereo. Relax in the television room and on the porch. A guest pantry is always stocked with coffee, tea, hot chocolate, popcorn and fresh-baked cookies. Browse through the movie library. Many spacious guest bedrooms have wood-burning fireplaces; some boast Jacuzzis and terry robes. 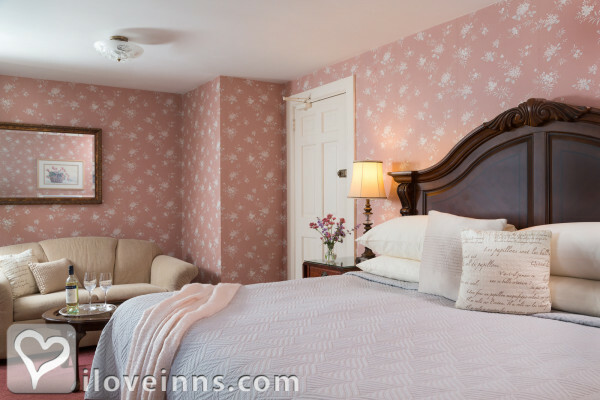 All rooms have complimentary cognac, locally hand-made chocolates and bottled water. A hearty country breakfast proudly features foods locally grown and or prepared. 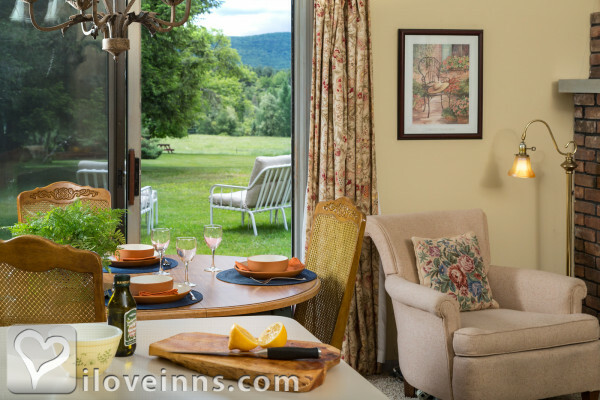 A tennis court and heated swimming pool offers pleasant onsite activities.Publicity and Awards: Discerning Traveler, New York Magazine, Karen Brown's Guides,Pamela Lanier,Berkshire Living, Berkshire Eagle.Location: Country and Mountains. 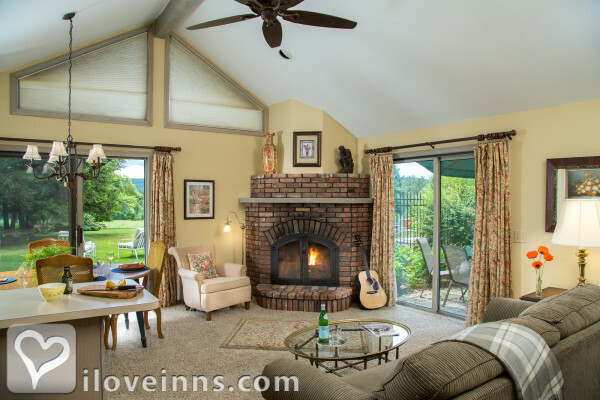 Queen bed with 2 comfortable chairs in front of the wood-burning fireplace and a beautiful view of the estate. 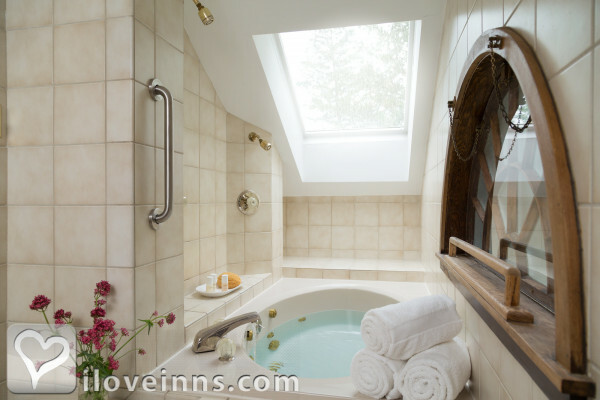 Full private bath with bathtub/shower combination and television/VCR. Lighted makeup mirror, hair dryer, toiletries, imported Cognac, bottled water and locally handmade chocolates. Queen-size bed, full private bath with bathtub/shower combination and television/VCR. Lighted makeup mirror, hair blower, toiletries, imported Cognac and locally handmade chocolates. Queen-size bedroom features a canopy bed with sitting area in front of the fireplace. Full private bath with whirlpool bathtub/shower combination and television/VCR. Lighted makeup mirror, hair dryer, toiletries,terry robes, imported Cognac, bottled water and locally handmade chocolates. 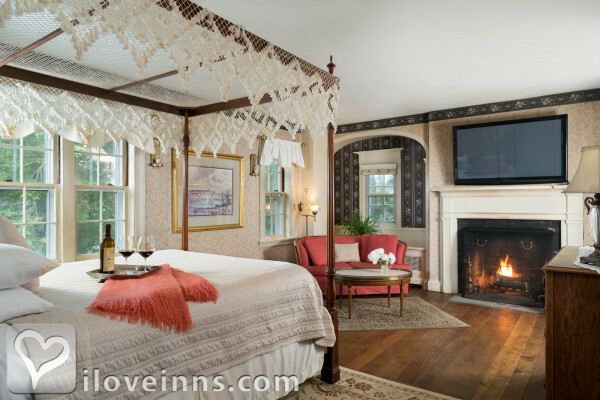 King-size cherry sleigh bed, wood-burning fireplace, in-room corner 2-person whirlpool bath. Art deco antique vanity, adjoining sitting room with cable television/VCR/DVD. 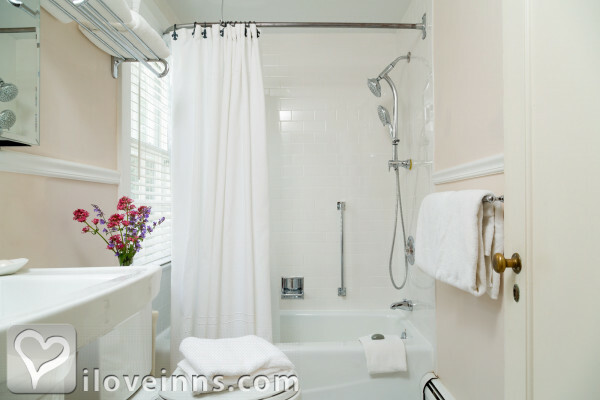 Full private bath with walk-in shower with body jets. Lighted makeup mirror, hair dryer, toiletries, terry robes, imported Cognac, bottled water and locally handmade chocolates. 4-poster Queen-size bed. Full private bath with bathtub/shower combination and television/VCR. Lighted makeup mirror, hair dryer, toiletries, imported Cognac, bottled water and locally handmade chocolates. King-size bed (or twin beds) features a full private bath with bathtub/shower combination, couch and cable television/VCR/DVD. Lighted makeup mirror, hair dryer, toiletries, imported Cognac, bottled water and locally handmade chocolates. King-size bed (or twin beds) features a full private bath with bathtub/shower combination and cable television/VCR. Lighted makeup mirror, hair dryer, toiletries, imported Cognac and locally handmade chocolates. 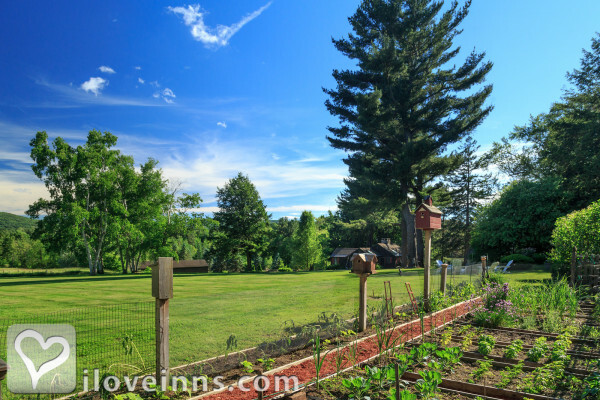 Wood-burning fireplace, sliders to deck and swimming pool with beautiful views of the meadow. King-size bed, bathroom with whirlpool tub/shower combo. Full kitchen & dining table. A living room with 32" flat screen TV/VCR/DVD & stereo. Queen-size pull-out couch. Lighted makeup mirror, hair dryer, toiletries, terry robes, imported Cognac, bottled water and locally handmade chocolates. Payment types accepted include Travelers Checks, Visa, Master Card, Personal Checks and American Express. Rooms: This property has 10 total guest accommodations with private bath, 4 with fireplaces, 4 suites, 1 cottage and 1 cabin. The types of beds available include King and Queen. Cancellation: A full deposit is required for one-night stays. A 50% deposit is required for two nights or longer stays. Deposits will be refunded only if notice is received no less than 14 days (30 days in July and August) prior to the intended date of arrival. A service charge of $50.00 per room will be deducted from the deposit. Guests who check out before the last day of the reservation will be required to pay for the days reserved in full. A partial refund may be possible only if able to re-book the room(s). A deposit is required on all rooms in order to guarantee the reservation. 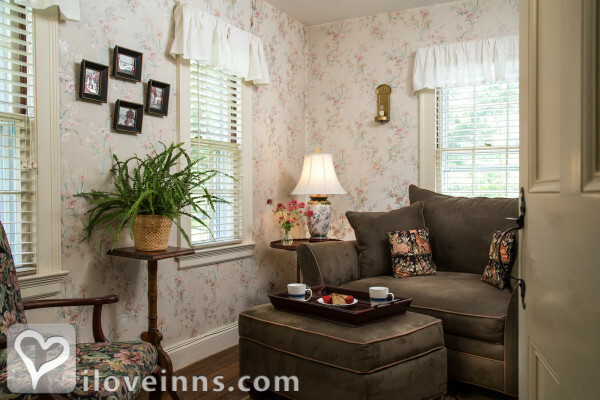 Pets: Innkeepers pets on premises, Pets Allowed and Cottage Unit only. Meals Included in Rates: Snacks/Refreshments, Breakfast, Fully stocked guest pantry with coffee/tea/hot chocolate/popcorn/fresh baked cookies, cognac, hand-made chocolates and bottled water. Types of meals: Early Coffee/Tea, Afternoon Tea, A fireside (fall/winter) candlelit gourmet breakfast is served on fine china accompanied by classical music and A bountiful buffet followed by a specially selected hot entree served table-side each day. Amenities In Room: CD Player, Cable TV, Bathrobes, Bath Amenities, Air Conditioning, Central Air, Clock Radio, Coffeemaker, DVD, Hair Dryer, Iron/Ironing Board, Modem Hook-Up, Reading Lamps, Refrigerator, Telephone, Television, VCR and Wireless Internet Access. Amenities On Site: Gift Shop, VCR, Tennis, Television, Limited Handicap Access, Swimming, Fireplace, Fax, Phone, Copy Machine, PC, Computers, Parlor Games, Child Care, Library, Bicycles, Tesla charging station, DVD, Flower-filled gardens, Tennis court, Heated pool and guest refrigerator for special snacks or refreshments. Business Traveler Amenities: Daily Newspapers, Desk, FAX On-site, Flexible Check in/out Times, Gym Nearby, Gym On-site, Hair Dryer, Internet Access, Iron/Ironing Board, Off-site Dry Cleaning Services, Television and Wireless Internet Access. On-Site Spa Services: Fitness Center. Events Hosted: Weddings, Meetings, Family Reunions and Romantic Getaways. Other Activities: Wineries, Tennis, Skiing Downhill, Skiing Cross Country, Shopping (Local Crafts), Parks, Museums, Live Theater, Horseback Riding, Hiking, Golf, Fishing, Canoeing/Kayaking, Bicycling, Art Galleries, Antiquing, Tanglewood, The Norman Rockwell Museum, Jacobs Pillow, Shakespeare & Company, Horseback riding, Ballooning, Downhill & cross-country skiing, Greenock Golf Club, Hiking, Biking, Archery, Fishing and Kayaking. 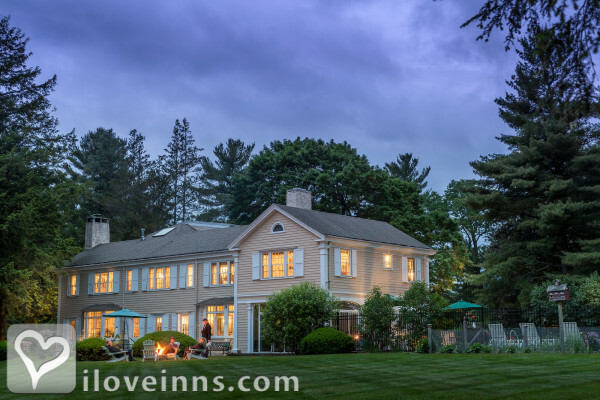 English-style country house originally built in 1800 by a Revolutionary soldier and modernized and landscaped in the early 1900s by George Westinghouse Jr., the son of the famous inventor. When Queen Wilhelmina of Holland came to Devonfield for a few months in 1942 to escape the looming Nazi takeover of her country, she was a guest at Devonfield. President Roosevelt paid a visit to the Queen and her daughter Juliana and grand-daughters Irene and Beatrix (the current Queen of Holland). Historic Awards: Local Register (Granted). Historic Memberships: Local Historical Society. 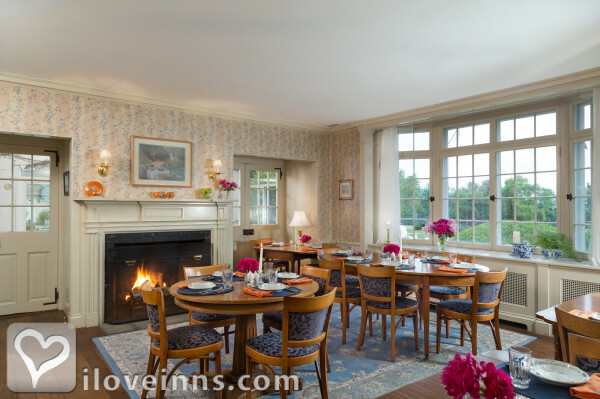 The inn overlooks a pastoral meadow shaded by graceful birch trees, with the rolling tapestry of the Berkshire Hills beyond. Whether looking for a romantic getaway or a perfect respite from everyday stress, enjoy your day and return to the inn to soak in the pool in summer, or sit by a roaring fire in winter and sip a complimentary glass of port.